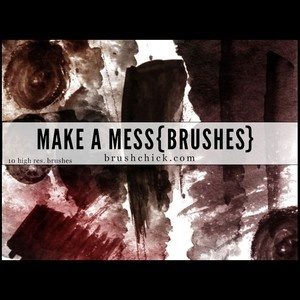 This set features brushes I made while making a mess. I mean, playing in some paints. I really am 24 years old. :) I just have a hard time acting like a grown up. These brushes feature 10 very large smudge-y, paint, grunge brushes ranging from 1200-2500 pixels large. Free for personal & commercial use as always :) Just don’t be a jerk & sell these as your own. OK?! Enjoy!